Now, you can peruse my Portfolio tab for a gallery sampling of my holiday & seasonal folk art as well as a peek at my Licensed Designs to see what's currently being produced in the industry. I've added an Illustrations area with art samples, organized by Vector Art, Ink & Dye, Mixed Media and even Public Art! Beyond that, enjoy a peek at my Surface Designs and Artful Living photography for inspiration and a look into our art-filled lives. In addition, we now have a Store link that branches out into different areas. Collectors Catch Originals is where collectors will gather for upcoming web sales, and my Signed Reproductions page will offer a peek at what I have ordered for upcoming sales. 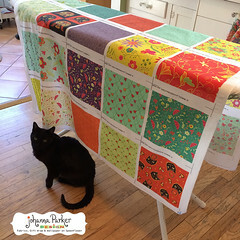 Besides dedicated pages to my Spoonflower fabrics and my home furnishings Roostery shop is my Printables Page! 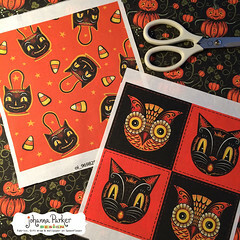 For years, I've heard your calls for instant digital downloads of my Halloween hats and other artsy projects, and now I can provide that for you! For a nominal exchange, you can print as many high-res files of my selected art for your own DIY experience! 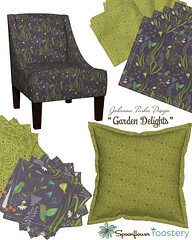 In fact, the cheerful Garden Delights Pennants in the graphic photo in this post is one of my new projects, and one of my faves! 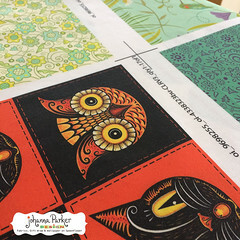 I truly hope you enjoy these projects that I've put together for you :) Speaking of printable, don't forget to visit our Print & Share page for growing list of FREE project downloads! We now have a much more thorough Events page and an About page that recognizes our little team. 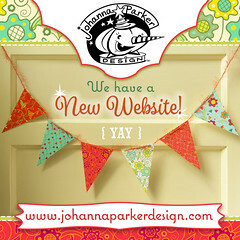 And with a New Website comes a New Blog! That's right, I will be moving my future Blog postings over to the Blog link on my site. As there are so so so many years of posts here on my Blogspot platform, I will keep things as they are so that you can still go back in time and visit past posts for inspiration. Plus, trying to migrate ALL 10 years of blog posts to a new site sounds pretty daunting right now. So, we'll keep things as they are for the time being. Thanks as always for your support! We hope you ENJOY all the eye candy over at our new Website! Out of the Box & into the Land of Hexagonia! I have a small, time sensitive favor to ask... 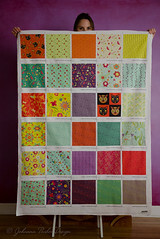 The brightly colored design below is my entry into Spoonflower's Hexagon Challenge. 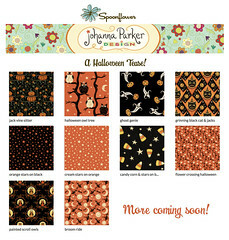 If you like it, will you visit Spoonflower's Contest page, locate my "Land of Hexagonia" entry and enter a vote for me? 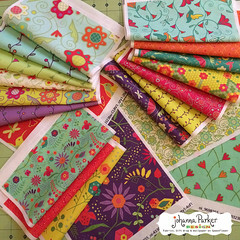 There are lots of pretty patterns to marvel at, so vote for your faves! (no need to log in ~ voting is open to the public) THANK YOU!! Voting ends tomorrow, March 28th! I know, I'm not giving you much notice, and if you're reading this after the due date, well I still want to share this fun design with you! 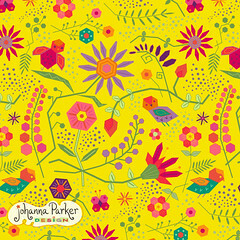 It will soon be available on fabrics, wall paper & gift wrap. Almost all the elements in this design are made up of 6-sided hexagons in varying shapes. I enjoyed making this pattern, and it certainly stretched my imagination a bit since I tend to think in swirls, curves and flowing lines. :) Thank you for your support! Given the title of this post, I did find myself thinking outside of the box and submersing myself into a hexagonal land :) I've been obsessed with patterns all my life, and lately, I have felt the need to let them out. Imaginative patterns are often the last thing I see before I fall asleep and many times, the first image to greet me in the morning. So many fun and pretty patterned ideas flash through my mind each day that I'm lucky to capture and manifest just a tiny slice of what I dream. 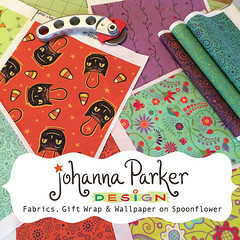 Visit my JohannaParkerDesign Spoonflower Shop to see what designs are currently available and also peek at my upcoming designs, for sale soon. Ho Ho Ho my friends! Vintage Holiday delights are here! Although fleeting, I was fortunate enough to get my hands on an assortment of samples from my screen printed Vintage Holiday collection of reproductions, and now I am releasing those to you! Each piece is SIGNED on the back or the base by me, the artist behind the design. 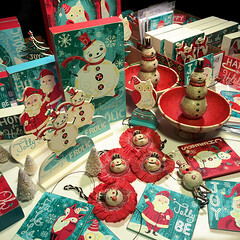 A few of the sets also include an 8 pack of my matching Christmas cards! You'll see that with some sets, I have also included a snowman ornament in the mix. 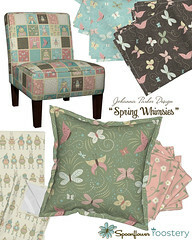 ALL of my designs being released here have been retired by their original manufacturers. Please review the descriptions below each image for more information, and click on the photos for a larger view. To reserve your faves please EMAIL ME and include the name of the set or single you wish to adopt! Also include your name, phone number and shipping address. When your order is prepared, we will send you an e-invoice to complete the sale. 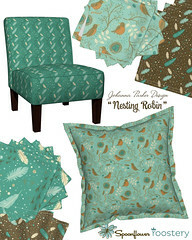 Thank you for interest in my collectible holiday licensed designs! ~ Each Santa Signed by the Artist ~ SOLD OUT! ~ Printed Trees, Signed by the Artist ~ SOLD OUT! I've got a special treat for you! I am releasing my small collection of vintage style holiday graphics, screen printed on box signs, ornament plaques and character stand-ups. These limited edition collectibles made only a brief appearance via Primitives by Kathy at last summer's gift market. 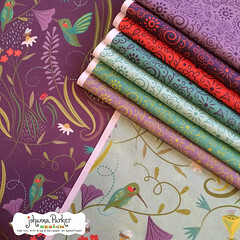 Shortly after, PBK's themes and color palettes took a different path, and hence, this retro winter collection came to an end. As these designs were not introduced at this January's market, it's safe to say that production was low, making these finds extra special! I was fortunate enough to get my hands on an assortment of samples, and I will soon be releasing those to you! Each piece is SIGNED on the back or the base by me, the artist of each design. Check back this evening, November 22nd at 6:30 pm EST for a medley of Collector Sets that will be posting here on my Blog. Well, despite waking up to a chilly blanket of snow, the sun is now aglow, and it's turning out to be a sunny Mother's Day! 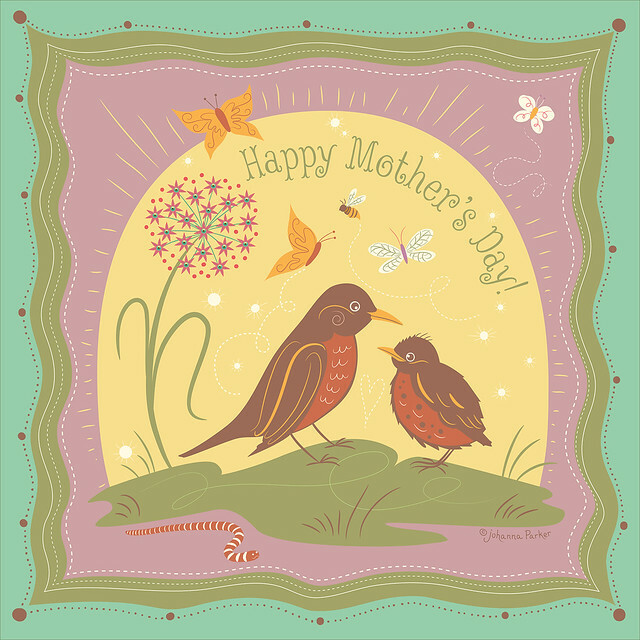 In honor of my Mom, and all the other moms out there, I made this sweet graphic depicting a mom and baby robin. Notice the nervous worm, sneaking away... hehe! Sending SUN and SMILES and STORIES that delight your SENSES! Well, it's official!.. EHAG * Eclectic Halloween Artists Group * has a new logo, and I designed it! Behind closed doors, or tucked away in front of our computer monitors, the moderators of EHAG, including myself have been thinking of new ways to put a fresh face on EHAG. Image is certainly key, and a new logo design was an obvious answer! With my graphic design experience and a few subtle nudges from our group's leader, I went ahead and started sketching. I thought it might be fun to share with you my process. However rough the sketches and initial graphics may look, it is a necessary step, at least for me in building a brand. Here's a peek at the evolution of EHAG's logo from a "closet graphic designer turned folk artist"... Hope you like it! * Finally, I shared this image with our EHAG mod's group, and they loved it! Phewwwwww...... It was a lot of work getting here. Just a few additions and a few more days, and I was ready to finish! * And WaaaaaLaaaaaa, here she is! It's BOLD and it screams HALLOWEEN in a classy sorta way.... YAY!.... 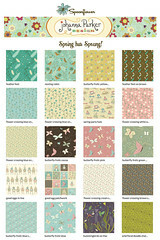 You can view it full size and see other various banners and badges I made at www.ehagart.blogspot.com.